On our recent trip to Toronto, just after our arrival, we were looking for somewhere right along Yonge Street close to our hotel to grab some lunch. The sun was out and we really wanted something that said Toronto and take in some sights with some outdoor seating. 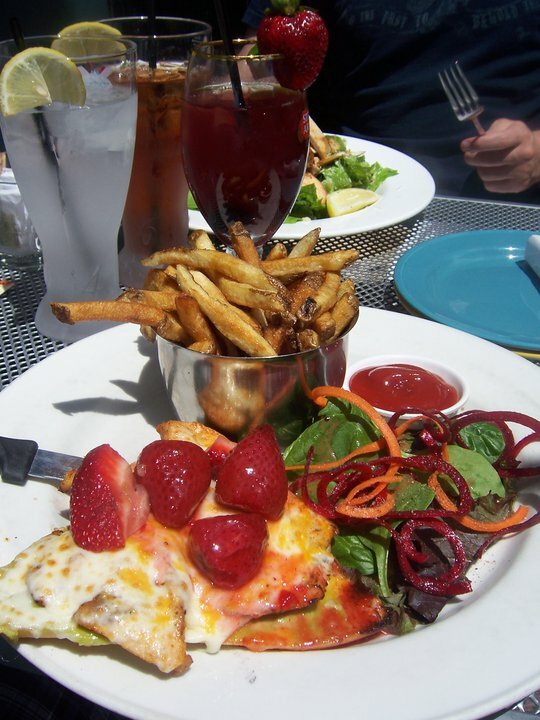 Just walking up the street, we found a place that caught our eye – Brownstone Bistro & Bar. It was early Thursday afternoon – around 2pm when were arrived and the abbreviated brunch menu was still in effect, but the abbreviated options didn’t bother me. I was in the mood for some Sangria to kick off our vacation. To go with my fruity beverage, I got the Summer Melt because it sounded delicious and intriguing! Summer Melt – Open face sandwich on a ciabatta with guacamole, tomato, grilled chicken and topped with a mix of fresh summer fruit. – $11.00 [link]. Each bite was a party in my mouth! And yes the summer fruit was on top of the sandwich. The chicken was butterflied and perfectly cooked. It was a piece of art. Previous On Top of the World! Next How do you Monte Cristo?